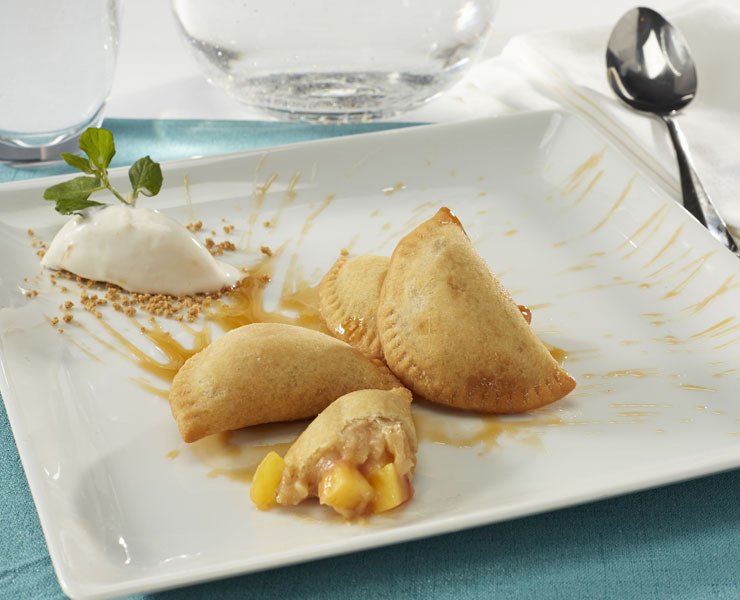 Peaches, paired with smooth custard like flavors of mascarpone cheese, wrapped in a masa-style mini pastry turnover. A sweet balance of peaches, paired with the smooth, rich flavors of mascarpone cheese, wrapped in a light mini turnover pastry. Kabobs’ Peaches n’ Crème Mini Turnovers create a welcome addition to breakfast, mid-morning breaks, and mini desserts. From Frozen deep fry at 350 ºF for 5 - 6 minutes or Until Done. Desserts: Pair with two scoops of ice cream, drizzled with caramel.Toss in cinnamon sugar. Drizzle with honey and sweet crème. Cramelized apples, mixed with cinnamon and nutmeg, wrapped in a cream cheese and brown sugar empanada pastry. Milk chocolate, paired with hazelnut, accented with raspberry puree, and placed in a pastry turnover.